A European rocket aborted its attempted launch of two new communications satellites today (March 30) due to a main engine glitch seven seconds after the engine ignited. 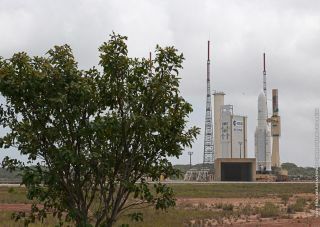 The Ariane 5 rocket was poised to blast off at 5:45 p.m. EDT (2145 GMT) from a launch pad at the Guiana Space Center in Kourou, French Guiana, when the malfunction occurred. As the countdown clock reached zero, the unmanned rocket ignited its main liquid-fueled engine, then shut down on its own when it failed an automated systems check, officials with the rocket's manufacturer Arianespace said in a statement. The automatic shutdown aborted the launch attempt before the vehicle's twin solid rocket boosters – which cannot be shut down once activated – had ignited. The 165-foot (50-meter) tall Ariane 5 rocket's main engine's checkout process "was not completed successfully, preventing the boosters' ignition and thereby aborting the mission," Arianespace officials said. "The Ariane 5 and its two payloads remain in a safe mode on the launch pad." Arianespace officials plan to haul the rocket back into a massive hangar building to investigate the problem. “We do not take any risks, and therefore it is very important we determine the causes,” said Arianespace Chairman and CEO Jean-Yves Le Gall in a statement. The Ariane 5 rocket uses a Vulcain 2 first stage engine assisted by two solid rocket boosters to launch satellite payloads into orbit. The Vulcain 2 engine is fueled by cryogenic liquid hydrogen and liquid oxygen and is designed to burn for about 600 seconds to boost payloads into space. Two different communications satellites are packed aboard the Ariane 5 rocket awaiting a trip to orbit. One satellite is Yahsat 1A, a craft built for the Al Yah Satellite Communications Co. of Abu Dhabi. Yahsat 1A is designed to provide direct television broadcasts and secure communications for government and military customers for several countries, including the United Arab Emirates, according to Spaceflight Now. Both satellites are destined for geostationary orbits about 22,200 miles (35,727 kilometers) above Earth, allowing them to provide communications services while keeping station over their respective coverage areas on the planet below. The Ariane 5 rocket can launch payloads of up to 10 tons to geostationary orbit, and haul up to 20 tons to low-Earth orbit a few hundred miles above the planet. A new launch date for the Ariane 5 rocket and its two satellites will be determined pending the results of the malfunction investigation.